James Buchal, the Multnomah County, OR GOP Chair, joined us for the Free Speech Rally in Portland, yesterday. In fact he spoke at the rally, delivering an exceptional, heart-felt speech. 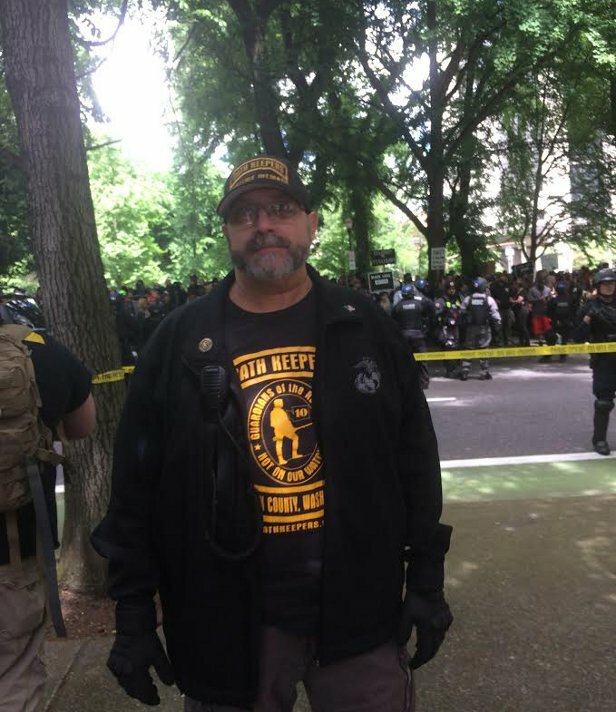 Oath Keepers provided him with a professional Personal Security Detail (PSD) to and from the rally, and he was kept safe the entire time. Not a hair on his head was touched, despite several attempts by Antifa to get close to him. He later stated that he "wouldn't have felt safe enough to attend the rally without Oath Keepers protection." It speaks well of him as a patriot and as a leader that he led by his example, speaking at an event that others were too afraid to attend. The Multnomah County Republicans are lucky to have him as their Chair. Like a true leader, he leads from the front and we hope the rest of the Multnomah County Republicans will follow his example. And if they do, we would be honored to protect them. to stab our members to death for daring to march in the Avenue of Roses Parade; Parade organizers told the newspaper they couldn't get assurances of police protection, and cancelled the Parade. No blood was shed in those cases, but Multnomah County Republicans don't feel safe in public, and we are trying to figure out how to respond. More and more citizens are stepping forward to assume the role of sheepdogs as the population of wolves rises. Multnomah County GOP chair James Buchal, however, told the Guardian that recent street protests had prompted Portland Republicans to consider alternatives to "abandoning the public square". "I am sort of evolving to the point where I think that it is appropriate for Republicans to continue to go out there," he said. "And if they need to have a security force protecting them, that's an appropriate thing too." Asked if this meant Republicans making their own security arrangements rather than relying on city or state police, Buchal said: "Yeah. And there are these people arising, like the Oath Keepers and the Three Percenters." Sorry to hear your elderly members are being assaulted and threatened with death for simply having a public booth, and now are afraid to go out in public in Portland, as Republicans. Thanks for thinking of us, but you're on your own there in Multnomah County, because we think it's just too risky for us to protect patriotic Americans from communist dirtbag terrorists in Portland. We've weighed the pro's and con's, and we just see no up-side (for us). But good luck!" Over my dead body, and not on my watch! I called Mr. Buchal on Wednesday and pledged our unconditional support, and I let him know that I will personally fly in from Montana, if necessary, to lead the way in ensuring that his people are protected at public events. I told him that he has a standing offer, and all he has to do is ask. And that we would do it for FREE. He was very grateful and we had a good laugh at how the leftist media is going crazy over his merely mentioning our name. We also chatted a bit about the coincidence of of both of us being Yale Law School graduates. As Chairman Buchal's testimony makes clear, the issue of defending free speech in Portland is not just about Patriot Prayer and their series of free speech street marches and rallies. It's far bigger than that. It's about the ability of all of the people of Portland to freely exercise their right to free speech, assembly, freedom of association, and their freedom to participate in the legal process and outreach and organize among their fellow Americans. Without that right, all of Portland, all of Multnomah County, becomes a dictatorship with one-party, one ideology rule enforced by street thugs and terrorists. PS - I am certain that many other patriotic organizations would be happy to help with any such security detail, and we welcome their assistance. All for one, and one for all in the cause of liberty. 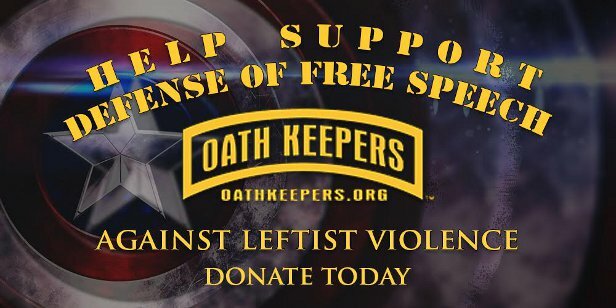 If you support our operations to protect free speech from far-left terrorist violence, please make a donation so we can keep doing this vital work. We protect events for free, not charging the event organizers or attendees a dime, but there are considerable costs in travel and logistics. Please pitch in. To comment on this report, GO HERE.